Show your college spirit with link walker's compact carry-all for your golf accessories! available in assorted colors, each Mini day pack prominently displays the college logo of your favorite college sports team. It features 2-zippered compartments, a mesh front pocket and a laced bungee drawstring. The larger zippered pocket is lined with plush fabric to protect your valuables and has room to fit most range finders or up to a dozen golf balls. Includes a grab-n-go handle, a strap to wear it over the shoulder, a carabiner clip to easily attach it to your golf bag or wear it on your hip using the belt loop. 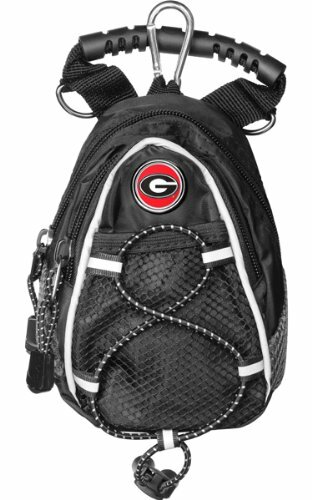 The Mini day pack is a perfect addition for any collegiate golf enthusiast! officially licensed by the NCAA. Mini day pack measures: 6.5" x 4.5" x 2.5"